What happens when you cross “urban” with “grocery”? You get “Urbery”, the GTA’s newest grocery delivery service. Simply place your order online, Urbery’s team of Grocery Guru’s will shop on your behalf, and then deliver your groceries to your door in under two hours. Urbery is currently in phase I of its service roll out, and is rapidly expanding to serve an even greater geographic area. Yorkshire Valley Farms recently had the chance to speak with Urbery’s founder Mudit Rawat to learn more about the inspiration behind the Urbery concept, what has been the most surprising learning since launch, and what’s next for the Urbery team. Can you give us a brief introduction to Urbery and what the service is all about? Urbery is the ultimate in urban convenience – a delivery service that allows customers to order groceries online from their favourite grocery store and have them delivered within two hours. We offer a selection of over 4,000 grocery items through our user-friendly online platform. At Urbery, you can expect to find everything you would at your local grocery store, including fresh produce, meat and seafood products, baked goods, dairy items, and of course pantry must-haves. Once a customer has placed an order, the request is routed to one of our knowledgeable and highly passionate personal shoppers, our Grocery Gurus. The Grocery Guru, who receives extensive training before shopping, will shop for the order and deliver it right to the customer’s door. We are currently operating in downtown Toronto and soon expanding our delivery zones to other parts of GTA. Can you tell us a bit more about your background and why you decided to start Urbery? The decision to start Urbery really came down to being in the right place at the right time. Seven years ago, I came to Canada to pursue my MBA at the Schulich School of Business. After graduation, I worked at several different corporate gigs including Oracle, CGI and finally Sobeys – Canada’s second largest grocery retailer. It was at Sobeys that I developed an interest and passion in the truly exciting world of food and groceries and started looking for ways the shopping process could be improved. Back in India, where I’m from, no one ever went grocery shopping – you didn’t have to because everything was delivered right to your door within hours of ordering. I wondered why such a system hadn’t yet caught on in Canada and started studying available grocery delivery services. None of the available services really appealed to me for one of two reasons: lack of on-demand delivery options, or exorbitant delivery fees. I decided that I could provide a better service than what was currently available and, given the welcoming environment Canada has created for entrepreneurs, I decided to start Urbery. What has been the biggest surprise since you started Urbery? The biggest surprise has been the number of people we’ve had interested in becoming Grocery Gurus. I’ve had the opportunity to meet and work with some fantastic people who are so passionate about food and helping others. I put a lot of time and effort into selecting the right people to become Grocery Gurus. It’s such an amazing feeling when I get feedback from customers telling me how impressed they were with their order and how much care the Grocery Guru took – and this happens a lot! When people actually take the time to contact you and let you know how amazing their experience was, you know you did a good job and hired the right people. At Urbery, we want to make sure that our customers have access to the healthy foods they need, including local food options. We chose to partner with Yorkshire Valley Farms because they uphold the values and business practices that are important to us and our customers, including working with local farmers, care of the environment, and respect for animal wellbeing. We’re obviously big fans of chicken, so we have to ask…what’s your favourite chicken dish? That’s a tough question as there are way too many dishes I absolutely love. I guess if I had to narrow it down to a favourite, I would say it’s my wife’s Chicken Parmesan – I’ve yet to taste anything better (but I may be biased)! Having been born and raised in India, I was lucky to have had the opportunity to sample a variety of exotic cuisines, and would say that chicken tikka masala with garlic naans would come in a very close second. What’s next for Urbery? Any developments you are currently working on (and able to share) that we can look forward to? A lot is happening in our business. Our delivery area continues to grow, as does our team. The biggest new development though is our upcoming mobile app. With our app, customers will have the vast selection of grocery store products right in their pocket. We’re also ‘brewing’ up something very interesting, and this is the first time we’re talking about it – We recently received our alcohol delivery license and have already started testing out deliveries with existing customers. Our full alcohol delivery roll out is coming in July and we will be the only company in Canada that can get customers their favourite grocery products and alcoholic beverage in under 2 hours! Use the promotional code WELOVECHICKEN to receive a $10 discount on your next Urbery order. How to use the discount code: Enter the code during the checkout process and $10 will be taken off the final bill. Delivery is also free for orders over $65! The WELOVECHICKEN discount code expires on July 31, 2015. There’s nothing quite like a good bowl of soup. It’s a comforting, wholesome, and very portable meal that can be enjoyed year-round. Yorkshire Valley Farms recently sat down with soup enthusiast Domenic Gaudio of Soup Nutsy to chat about bone broth, the latest addition to his extensive soup menu. 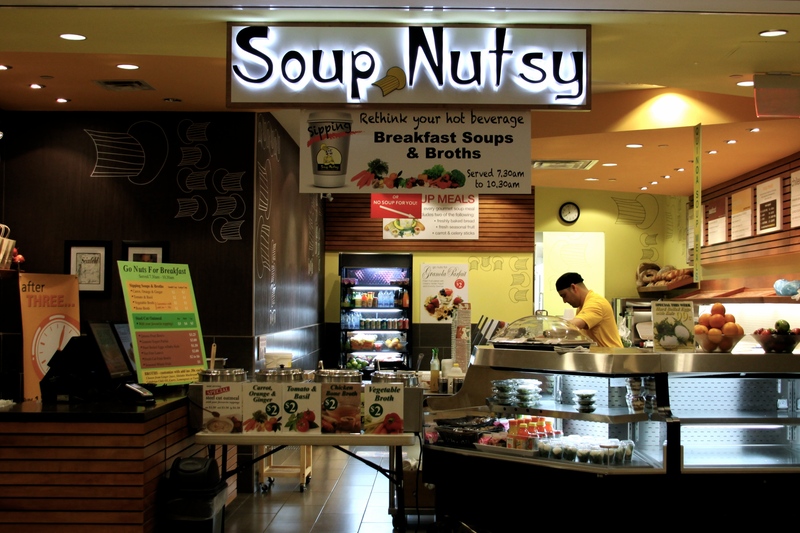 With three locations in Toronto, Soup Nutsy is one of the city’s premier soup destinations for the downtown office crowd. All the soups are made in-house, offering quality soups and broths that would make your grandma proud. Soup Nutsy’s new chicken bone broth is available at the Richmond-Adelaide location and is served as a sipping broth, to which you can add flavour enhancers (which are also made in-house), like ginger, turmeric, garlic, shiitake mushroom tea, or Calabrian chili oil. Below Domenic tells us more about the new bone broth, about the inspiration behind Soup Nutsy’s menu, and about his favourite soup. How did Soup Nutsy get started? Can you tell us a bit more about your background and why you decided to open a soup shop? Soup Nutsy originated in New York City shortly after the Seinfeld “SOUP NAZI” episode was aired. The popularity of the show created so much hype that it spurred the opening of many soup operations. We were so impressed with the success of the concept that we purchased the rights and opened in Toronto in 1998, and Soup Nutsy became an instant success. I joined the company a few years later after spending many years in the food service business with various companies. Can you tell us a bit about the inspiration for some of your most popular soups? Our inspiration comes from many sources such as food trends, consumer eating habits, exotic flavours. We are constantly searching and developing soup recipes that will keep us current and on the frontline of our industry. What has been the biggest surprise since you opened the shop? I guess the biggest surprise was the success of our concept given that soup was always thought of as a side for many dishes. When we introduced it as the centrepiece of the meal, we had a lot of people doubt us that it could work. Why did you choose to work with Yorkshire Valley Farms? What will you be making with our organic poultry? We wanted to work with a company that produced high quality organic poultry that would enable us to create a healthy and nutritious product. We are currently using Yorkshire Valley Farms’ organic chicken bones to make chicken bone broth. We have to ask…what’s your favourite chicken-based soup? Old fashioned chunky chicken noodle. What’s next for Soup Nutsy? Our goal is to improve our business model and look towards expansion. We recently introduced a breakfast program featuring BREAKFAST SIPPING SOUPS AND BROTHS at our Richmond-Adelaide Centre location that is doing very well. We plan to further develop this as part of our business and implement it in our other two stores in the near future and heighten awareness for sipping soups and broths to “re-think your hot beverage”. A cup of chicken bone broth, made with Yorkshire Valley Farms organic chicken bones.